Traveling with your pet usually involves more than putting the animal in a car and driving off, especially if you will be driving long distances or be away for a long time. The American Animal Hospital Association (AAHA) offers these tips to help you prepare for a car trip with your pet and make it go a little smoother. If your pet is not accustomed to the car, take it for a few short rides before the trip. This can help keep your pet from becoming nervous or agitated, and may lessen the effects of motion sickness. If, after a number of practice trips, your pet continues to cry excessively or becomes sick, consult your veterinarian. Buckling up is an important safety precaution for your pet. Many states now require that pets be restrained while in a moving vehicle, and restraints have several advantages. They help protect pets in case of a collision, and they keep pets from running loose and distracting the driver. They also keep pets from escaping the car through an open window or door. Cats and smaller dogs are often most comfortable in pet carriers, which can be purchased in various sizes at most pet stores. Carriers give many animals a sense of security and familiar surroundings, and can be secured to the car seat with a seat belt or a specially designed carrier restraint. There are also pet restraints available that can be used without carriers, including harnesses, seat belt attachments, pet car seats, vehicle barriers, and truck/pickup restraint systems. No matter what kind of restraint you use, be sure that it does not permit your pet’s head to extend outside the car window. If pets ride with their heads outside the car, particles of dirt can penetrate the eyes, ears, and nose, causing injury or infections. Excessive amounts of cold air taken into lungs can also cause illness. While packing for your trip, remember to throw in a few of your pet’s favorite toys, food and water bowls, a leash, and food. You should also carry a first aid kit for your pet, and know basic pet first aid. If your pet is on medication, be sure to have plenty for the trip — and then some. Dr. Walt Ingwersen, AAHA veterinarian in Whitby, Ontario, points out that veterinarians cannot write a prescription without a prior doctor/patient relationship. This means that in order to get any drugs, your pet will need to be examined first by a new doctor. This may be inconvenient if you need medication right away. Also, if your pet is on a special therapeutic diet, bring along an extra supply in case you can’t find the food in a strange area. Stick to your regular feeding routine while traveling, and give your pet its main meal at the end of the day or when you’ve reached your destination. It will be more convenient to feed dry food if your pet is used to it. Dispose of unused canned food unless it can be refrigerated. Take along a plastic jug of cold water to avoid possible stomach upset the first day, as new areas can have minerals or bacteria in their water supply that pets need time to adjust to. Give your pet small portions of both food and water and plan to stop every two hours for exercise. Remember that your veterinarian is a good source of information about what your pet will need when traveling. Consider having your pet examined before you leave as well, to check for any developing problems. If an emergency occurs while you are on the road, you can call the American Animal Hospital Association at 800/883-6301 or visit our hospital locator for the names and phone numbers of AAHA veterinarians near you. Have your current veterinarian’s phone number handy in case of an emergency. Also, be sure to travel with a copy of your pet’s medical records, especially if the animal has a difficult medical history. Some pets travel better while tranquilized. Tranquilizers can lessen agitation and motion sickness in pets traveling by car. Discuss this with your veterinarian. Your veterinarian may suggest giving your pet a tranquilizer three to four weeks before your trip to check the dosage and adjust it if necessary. Find hotels, motels, and campsites that accept animals and book them ahead of time. Learn more about the area you will be visiting. Your veterinarian can tell you if there are any diseases like heartworm or Lyme disease and vaccinations or medications your pet may require. A health examination following your trip should be considered to determine if any internal parasites (roundworms, hookworms, heartworms) or external parasites (ticks, fleas) were picked up in contaminated exercise or wooded areas. Also, be aware of any unique laws. Some places have restrictions on exotic animals (ferrets are not allowed in some cities), and there are restrictive breed laws in others, such as no pit bulls allowed. Your pet could be affected by these laws, so call ahead to the city or travel information bureau for more information. 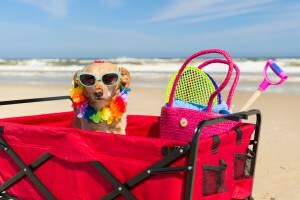 To avoid losing your pet during a trip, make sure your pet is wearing an I.D. tag. To be doubly protected, consider having your pet tattooed or having a microchip implanted. “The more methods of identification, the better chance that the owner will be found,” says Dr. Ingwersen. Microchip databases are specific to the United States and Canada, so register your pet in both countries if you will be driving from one to the other. Dr. Ingwersen also suggests owners register the name and phone number of a relative who can identify the pet in case the owner can’t be reached while traveling. It’s important to carry health and rabies vaccine certificates, particularly if you will be crossing the border into Canada, the US, or Mexico. All three countries allow dogs and cats to enter if they meet stringent entry requirements. Depending on the country, exotic pets may be allowed to enter, though they may need further documentation. Call the Agriculture Department or embassy of the country or state to which you are traveling for information on the vaccinations, documentation, fees, or quarantine that may be required to bring your pet into the country. Most importantly, try to plan ahead for unusual or emergency situations. What you don’t need in the middle of a trip is one more thing to worry about. “People get into a panic if they don’t have enough medication for their pet, no appropriate documentation for travel to other countries, or money to pay for border fees,” says Dr. Ingwersen. “Be prepared by bringing a copy of your pet’s medical records, proper documentation and medication and knowing the laws going into the new city or country.” Preparation is the most effective way to help ensure a smooth, enjoyable trip for you and your pet. This entry was posted on Friday, June 15th, 2018 at 8:31 am	and is filed under Cat, Dog, News & Updates. You can follow any responses to this entry through the RSS 2.0 feed. Both comments and pings are currently closed.